Today we’d like to introduce you to Jennifer Jones. I’ve been an athlete my whole life. I came from a family of athletes. My mom was a cheerleader and track athlete and my dad was a football and basketball star. That’s actually how they met lol. I started out cheer-leading and playing softball when I was younger and as I got older, focused my energy solely on volleyball and basketball throughout Junior High and High School as a student-athlete. I loved playing both sports and even went on to play volleyball two years collegiately. So I’ve always been very active and fairly healthy growing up. I started to get healthier and focus more on what I was consuming when my college volleyball coach would not allow us to eat fast food or drink sodas during the season. She stressed the importance that being an athlete you have to provide your body with the proper fuel it needs to perform better. That’s probably the beginning of when I started taking health and what I was putting into my body more seriously. Fast forward, after college and playing sports, I still longed for a need to compete. While I still worked out, I had been competing my whole life and I felt a void by not being active in any sports or form of competition. That’s when I saw these women at the gym who looked amazing and training so intensely and I was like “I want some of that!” That’s when I discovered Bodybuilding and started competing in Figure Competitions. I loved working out and now that my workouts had a goal attached to them, it was a way to fulfill my need to compete again. This time, just with myself. Which is really the only person we should be in competition with anyway. I competed for four years and was fairly successful. Even qualifying for Nationals. But for those who may not know, Bodybuilding is a tough sport. It is mentally, physically, emotionally and financially draining. My life revolved around my workouts, crazy restrictive eating and basically no fun. There was no balance in my life and Bodybuilding was consuming it and no longer in a positive way. However, during those years of training and competing, I found another passion which was helping others reach their health and fitness goals. I started my own Personal Training business in 2010 and even though I was competing in a sport that judged you based on your outside physique, I took a different approach than most trainers and was helping my clients get results from the inside out. Teaching my clients the importance of a positive mindset, balance and what you put into your body. All lessons I had learned along the way from my years of competing. I have since stopped competing in Bodybuilding and moved away from Personal Training and I’m now practicing Holistic Health & Wellness. Which brings to where I am today. Balanced and happy! ? I listened to my body, took a break from working out so intensely, started to eat more and not deprive myself and started to actually enjoy life! Holistic or Wholelistic Health is the study of the whole body/person which includes mind, body, spirit, emotional and environmental health in the quest for optimal health and wellness. In which case I help my clients get to the root causes of their health issues and together we create a roadmap that will support them on their journeys to better health. I healed myself through this practice and have been studying, practicing and assisting my clients as a Certified Holistic Wellness Consultant for the past five years through my company JENuine Nutrition. I’m extremely passionate and Jenuine about what I do and I look forward to helping many more people! ? LOL! Most certainly not! Wow, where do I begin?! One of my main struggles was learning how to get out of my own way, learn how to let go and just trust the process. Also having that unwavering belief and confidence within myself. I struggled with that a little. In hindsight, I think all of these things come with time and experience. Something you don’t realize in the moment because you’re wanting everything now. Oh and wanting everything to be perfect lol. This mindset stalled me for a few years because I was afraid to make a mistake so instead, I did nothing. Lol! I laugh at this now and can’t believe I allowed something that is not attainable (perfection) hold me back for so long. Whew, glad I got over that! Please tell us about JENuine Nutrition. The name of my company is JENuine Nutrition and I specialize in Holistic Health & Nutrition. Holistic or Wholelistic Health is the study of the whole body/person which includes mind, body, spirit, emotional and environmental health in the quest for optimal health and wellness. As a Holistic Wellness Consultant, I help my clients get to the root cause of their health issues by becoming more in tune with their bodies. Covering these four areas creates the foundation for both a substantial mental and physical transformation. When you change your mindset, you have the ability to change your body and your life. 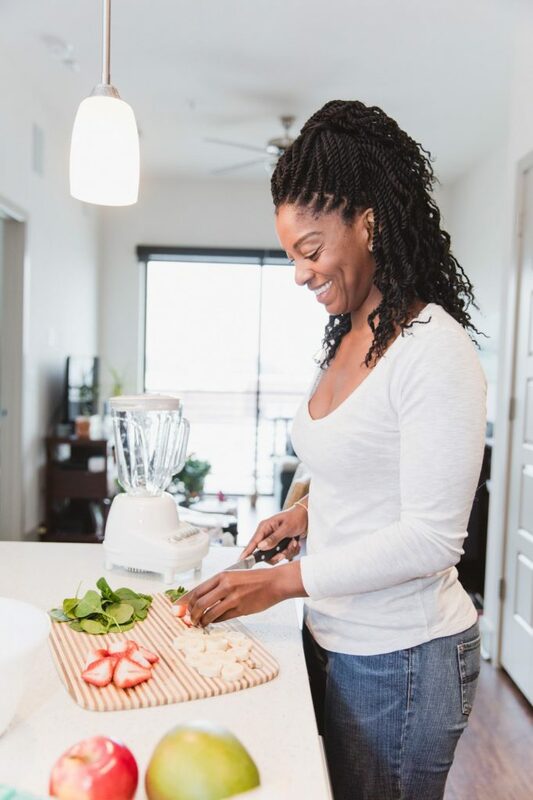 Together, my clients and I create a road map towards their nutrition goals and after completing their programs, my clients are left with the tools and skill set that will last them a lifetime to help successfully navigate any obstacle that may come their way. My clients experience weight loss, decreased stress, increased energy, better sleep, improved eating habits and more. I’m most proud of being able to help give my clients their power back to create and live their healthiest, happiest lives. It’s amazing to witness and I’m honored. My favorite childhood memory would have to be growing up in the country, playing outside, climbing trees, making mud pies and catching lightning bugs. Lol, Mudpies and lightning bugs….. those were the days. Just living in the moment without a care in the world.